Edulis is the tasting restaurant in Toronto known for its seasonal menu focused on seafood, vegetables and wild mushrooms. It is No. 8 in Canada’s Best 100 Restaurants in 2016 and No. 6 in Post City Toronto’s Joanne Kates Best 50 Restauants “Spend A Lot” List. Edulis has two tasting menus: 5 courses ($65) and 7 courses ($85). I recommend the 7 courses since it’s a better value on a price-per-course basis, and you will most likely not get full with 5 courses as they are tasting portions. It’s very good for seafood lovers as most of the courses are seafood. My favourites during the tasting menu were the Nova Scotia bigeye tuna and Poached Lobster. Note though, as the menu changes frequently, these may not be available anymore. The Poached Lobster with Pumpkin Seeds was very fresh and delicious and goes so well with the sauce! I even finished the sauce on its own! 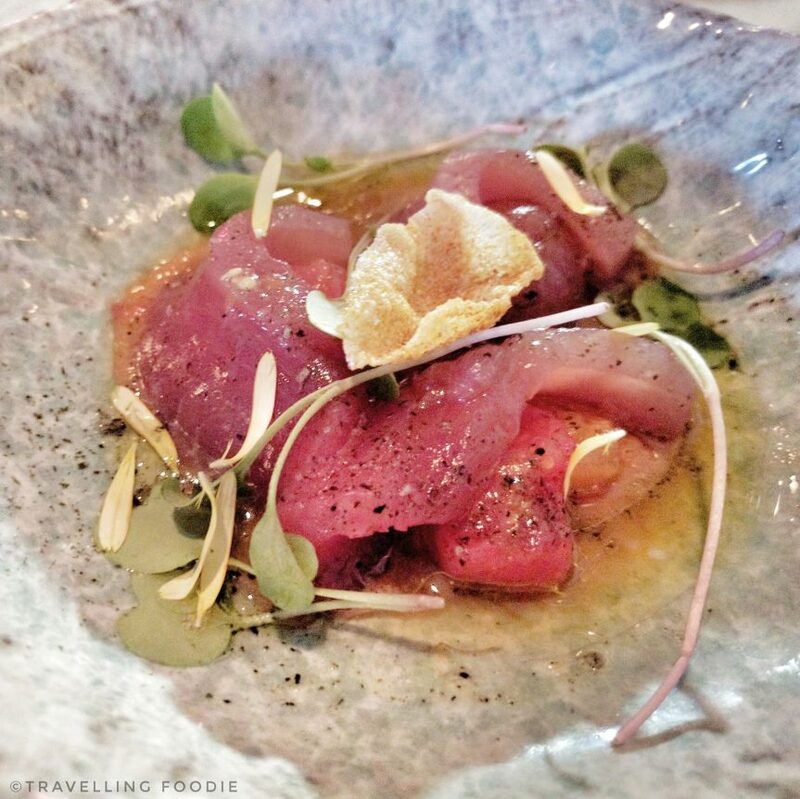 The Nova Scotia bigeye tuna with tomatoes sauce & black garlic was, again, very fresh. It was also very fatty and melt-in-your mouth, which went amazing with the tomato sauce and black garlic to bring out the freshness even more. One thing I love about how they make their dishes is the sauces or condiments were all subtle and were mainly there to enhance the main item – be it the seafood or meat. With seafood especially, I find it important that the natural flavour of the seafood to be intact because seafood can get overpowered easily. The desserts I found were particularly underwhelming. The Rum Baba was heavily soaked in rum such that the cake had no texture and bite anymore. Such a shame considering the flavour was actually quite good especially with the mix of chantilly cream. The other dessert, strawberry and chamomile sorbet, was nothing special and quite unremarkable. Normally, I focus on the food more than the service. However, the service at Edulis was pretty bad that I have to mention it. For this caliber of restaurant, I expect service to be on-par with similar restaurants on the same level and ranking. However, what we got was rude and condescending, and slow service. One incident was when we selected our tasting menu and the server asked for allergies/restrictions, our friend told the server that her tasting shouldn’t have meat courses because she doesn’t eat meat and she had indicated that on the reservation. Our server responded: “You know the menu is seafood right?” My friend said she’s reminding just in case there is still a meat course. It turns out there was a rabbit course. Another thing to note is this is the first tasting restaurant I’ve been to that don’t give you a copy of the menu at the end of the meal. When we asked for it, we were told they don’t do it but we can email the restaurant for a list. However, we never received them after my friends emailed the restaurant and followed-up a couple of times. Overall, I love the food at Edulis, but not the service. It’s a great culinary experience for seafood lovers especially and price is pretty reasonable for what you’re getting. Hopefully, the service we got was an off-day situation. Posted on February 15, 2017 by Travelling FoodiePosted in Canada, Food, Ontario, TorontoTagged restaurants.